Live Green, Wear Black. : Surprise Radishes! 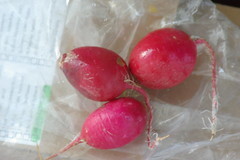 This morning, I found these three lovely radishes wrapped in a plastic bag on my porch. No note and no e-mail (yet) - I wonder who left me this gift?